Was the Trump Tower meeting with Russian lawyer ‘totally legal,’ as Trump said? By John Kruzel on Tuesday, August 7th, 2018 at 2:46 p.m.
How often do American political campaigns seek damaging information from a foreign government? According to President Donald Trump, attempting to weaponize this kind of dirt against political opponents is common practice — and perfectly legal. At least that’s Trump’s latest thought concerning a meeting at Trump Tower that his son brokered during the election. 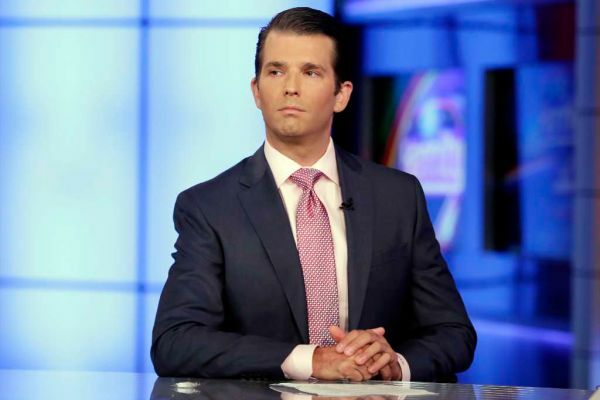 Donald Trump Jr. agreed to the meeting after being told a Russian government lawyer would hand derogatory information on Hillary Clinton to the Trump campaign. "Fake News reporting, a complete fabrication, that I am concerned about the meeting my wonderful son, Donald, had in Trump Tower," Trump tweeted Aug. 5. "This was a meeting to get information on an opponent, totally legal and done all the time in politics - and it went nowhere. I did not know about it!" Trump’s tweet adds a fresh layer to the series of shifting explanations around the Trump Tower meeting. It also raised a couple key questions we decided to explore. We can’t rule definitively on Trump’s claims about the meeting, because we don’t know enough about what happened behind closed doors. Nevertheless, we found many reasons to be skeptical of Trump’s claim that the Trump Tower meeting was simply par for the course. Was the Trump Tower meeting legal? We contacted legal experts shortly after the meeting came to light July 2017. They cautioned against drawing any premature legal conclusions, but said the interaction raised serious concerns about whether U.S. federal election law was broken. Before we look to the legal landscape, here’s a brief recap of the June 9, 2016, Trump Tower meeting. The younger Trump arranged it after a business associate of his father’s emailed to say that Moscow supported his father’s candidacy, and that a Russian government official could pass on incriminating evidence against Clinton. "The Crown prosecutor of Russia (...) offered to provide the Trump campaign with some official documents and information that would incriminate Hillary (Clinton) and her dealings with Russia and would be very useful to your father," Rob Goldstone, a business associate of then-candidate Trump, wrote to Donald Jr. in an email that would set the Trump Tower meeting in motion. "This is obviously very high level and sensitive information but is part of Russia and its government’s support for Mr. Trump," Goldstone added, noting that a "Russian government attorney" would be willing to meet with Trump, Jr.
Days later, on June 9, Trump Jr., then-campaign chairman Paul Manafort and President Trump’s son-in-law Jared Kushner met with a Russian national and several others. According to reports, at least eight people attended the meeting. The key Russian national was Natalia Veselnitskaya, who Goldstone referred to in his email to Trump, Jr. as a Russian government attorney. Veselnitskaya later acknowledged having close connections with Russian prosecutors, and in her role as an attorney, she has counted Russian state-owned businesses and the son of a senior government official among her clients. She entered the Trump orbit based on a promise that she could bruise the Clinton campaign. Given these circumstances, was the Trump Tower meeting illegal? Perhaps. Federal law prohibits a foreign national from giving anything of value to a campaign engaged in a U.S. election. For their part, both Trump Jr. and Veselnitskaya have said she did not hand over sensitive information on Clinton. However, it’s also a crime to solicit a foreign national to give anything of value to a campaign, or even to "knowingly provide substantial assistance" in receiving something of value. Is ‘oppo’ outreach to foreign governments ‘done all the time’? No. Most consultants we checked with said that the meeting between Trump campaign officials and the Russian lawyer were far from run-of-the-mill in the world of opposition research, or "oppo." "I have been working on campaigns since 1994 and have managed races since 1998," said Mike Mikus, a Democratic campaign consultant who often works in Pennsylvania. "I have never heard of any operative meeting with a representative of a foreign government – friend or foe – to discuss opposition research." Mikus called the argument that the Trump Jr. meeting was an ordinary occurrence "purposeful misdirection." Steve Schale, a Democratic operative based in Florida, said he’d never taken part in a meeting with a foreigner about opposition research. "Outside of the foreign press, in 21 years, I met with two foreign nationals while officially working on a campaign," Schale said. "One was a British member of parliament who was visiting family and just curious about U.S. campaigns. The other was the chair of the Kenyan human rights coalition who was in Florida doing a documentary about his former law school classmate, Barack Obama." Even the Kenyan got a thorough vetting before the campaign met with him, Schale said. That said, "unusual" doesn’t mean "unprecedented." One example that’s been cited by the White House and its allies is a case of the Hillary Clinton presidential campaign’s involvement with information originating from Ukraine. Another example concerns efforts by Chinese nationals to help Bill Clinton’s presidential campaigns in the 1990s, though that was more about questionable fundraising practices than about opposition research. An even older example concerns efforts by then-presidential candidate Richard Nixon to work with the South Vietnamese government to delay any peace deal in order to deprive his opponent, then-Vice President Hubert Humphrey, of an accomplishment during the 1968 campaign. So what should a campaign do if confronted with an offer like the one Donald Trump Jr. accepted? Some consultants suggested that the Trump campaign should have gone to the FBI. But even if they didn’t go that far, they should at the very least have consulted with a lawyer before taking the meeting. "Calling your campaign's general counsel for some guidance would seem well within the bounds of good judgment," said Scott Jennings, a Republican consultant based in Kentucky. "Then you let a lawyer decide what is the appropriate thing to do."